Tier 7. You can mention that to anyone whose done this event and watch them physically cringe. This tier is unforgivably hard. It’s on the level of complete absurdity. I’ve been attempting this tier for hours on end. I know it’s possible with my characters, more on that later. It’s the most frustrating and annoying thing to ever exist. I get you want to make a challenge, but when that challenge is almost implausible without the hard to obtain BH, then it becomes unfair. Most other events, not Protocal Droid, are beatable with different teams. Even BB 8 can be solo’d witha single character. This event isn’t. If you want the easiest way, you need to farm someone like Embo, Bossk, or even Jango Fett. They take extraordinary amounts of time due to how bad hard nodes are and how little you’ll get. I’m a F2P and this dream is so far fetched while having a farm for Revan. Killed Chewie and nearly killed Han, but was cucked by RNG. This is impossible. Share your horror stories. 1. Leave out the single most powerful BH (bossk) , which is also completely FTP, and use only the bad ones. 2. Leave even the 2nd best BH (cad) seriously undergeared. Horror for me too, but it is possible. If you want to do the event with undergeared toons, you have to be prepared to try millions of times even with great mods, or pray for great luck with RNG. The moment the event description says g11+, you can't really complain that it takes hours to get the RNG to beat it with G9 toons in your team. It's another problem that the event makes even a full G12 squad heavily RNG dependent, but once you have the required gear level, 1-2 zetas of the right kind (Bossk lead especially) and some decent mods you don't need to attempt it for hours any longer. Altough, as you said, it should be possible to beat the event with your team. You need 2 crit chance and 4 crit damage/offense mods on Boba, with as much speed as possible. Potency sets on all the other hunters, all their omegas except for leader ability (you need only for Boba obviously). Potency cross on all your BH. Don't use IG's AOE, ever. It feeds TM to the other team. Your kill order should be fine. What worked for me for T5-T6 last time (I was heavily undergeared, this time I had full G12 for T7) is to load Lando up with some debuffs, while still trying to take down Chewy first. This way you have a saving belt for Boba if he dies too soon as you can execute Lando and get BH's resolve back on him immediately. You missed out a very important thing and i think it is usually the problem people have. What are the mods you have set on each characters ? I think it is not really the point. It is all about fun. Is this game mode fun? No this is not. Even for those who unlocked already Chewie 7* I have full team g12, Bossk double zetaed, cad, boba fett, greedo and IG88, yes I should have work on Dengar but still, with this team I can't even dream of success this event and I'm already at few hundred tries. Mods? Tried a lot of, my best ones and still don't have any clue of what I can make to success except rng rng and rng again. Is this fun? No. Sith raid first version : not fun. Now it is real better. Losing in ga? Still fun. Losing in Raids : still fun. In Arena : still fun. It is the worst part of the game because it is so unfair. If you're not using bossk lead for this event, you need to mod extremely wisely to get the best out of your boba lead. This event is extremely difficult yes, but also extremely attainable even at gear 10 if you load up on potency for survivability. Get over it, the event is hard but not "complete absurd" or "impossible" by any means. Lots of people built a solid BH team and got him with only a few tries. If it took you more than that it's because you choose the wrong BH to gear up or you don't have enough gear or proper mods on the team. Legendary toons should be difficult to get, so just because you have a handful of 7* BH don't mean that you should automatically get Chewie. Maybe if you spent a little more time working on the toons and less time **** in the forums you'd gotten the Wookie. Only got 5* Chewie when the event previewed last time. Worked HARD on BH since then. Cleared tier 7 on the 3rd try, losing 2 toons. There's a lesson in there somewhere, I think. I just got 5* chewie with boba g10,cad g10,greedo,zam, and dengar g9 and no zetas. 2. I’m working on gearing them, like I said. I’ve got my guys loaded with as much potency as I can get them. Please don’t speak for everyone. It’s extremely hard. Not everyone has Bossk nor has the time to farm them while having to farm so many other characters. There’s no wrong BH to fear, it’s possible with the team I have, but RNG dictates heavily on the battle. Nor should Legendary events be horrifyingly hard, if you’d look back on the previous events. Yes, but you could go it with very low gear. Still can be done relatively easily. When your Legendary character takes more time and effort then a Hero Journey character, something is wrong. I agree, this event is stupid hard. In my guild i've watched people unlock chewie with 3 g9 BH. I still cant get him with 2 g12 and 3 g11, with a bossk zeta lead. The only difference, other than the obvious gear levels, is that they have dengar. I have stronger BH than most of the people who have unlocked him already, but because i dont have the cripple/cyborg dengar, i have 0 chance of getting chewie 7*. And before someone points out the obvious mods, I have tried different mods. I've tried with high survivability, high speed, nothing. What p***** me off the most about this event is the unspoken requirement of dengar. JUST SAY DENGAR IS NECCESARY CG! This d*** event may make me rage quit this game. The difficulty for Hero toons has never been the event, it's the farm. Bossk is the key with that gear on the others. well thats helpful. I did mention that my bossk is already with a zeta and is one of my g12. Unless you were answering someone else? zBossk is great, but if he's stunned or the rest of the team is under-prepared, it's not gonna help. Mine was g12+3 (including a fsr piece) with both zetas, and he didn't survive the encounter. In fact he got a taunt off, then died before taking another turn. Dengar is also great, but it's a bit of luck even with him. On the run I cleared he didn't get critically hit, so R2's smokescreen went off anyways. He makes you less reliant on RNG (and is a great healer under bossk lead), but he's not necessary. No one is. so if dengar isnt necessary then why can people with 3 g9, 1 g10, and 1 g11 beat it with dengar after a few tries and I, with 2 g12 and 3 g11 cant even kill one of them? I agree its an RNG s***fest, but with that kind of gear on my toons i should be able to blow through it. Heck, i can even do almost all BH events on auto without any worries. Not to mention the fact that r2 appears to have insane amounts of life/protection. No, without dengar around to allow you to hit people other than r2 i believe the event is nigh impossible, unless you have god RNG and they dont use any abilities. I think this event, like c3po, has been made waaaay too hard. I think CG has forgotten what their old legendary events look like. Even if i had all 5 BH g12 with all of their zetas, i dont think i'd be able to beat it. They didn't forget, they just changed the model. And C3PO was easier. If anything they decided to ramp the new model down a bit for the newest one. Because it’s substantially harder without the ideal team. That doesn’t make the ideal team necessary. If Dengar was necessary there wouldn’t be anybody completing the event without him, and there are such people. Even if i had all 5 BH g12 with all of their zetas, i dont think i'd be able to beat it. I was eagerly awaiting this event with my BH team, all 7*, G12, and had been ripping up on all events that I could use them in the past month. Then this event started, and I promptly beat T6 first try, then on to T7. Tried about a dozen times, and made zero progress. Mention on our guild discord that I was surprised by the difficulty of the event, and I was going to have to optimize my mods, because I figured that was what I'd overlooked. Spent a hour or two creating mod sets that should be best for what was needed. Tried maybe another dozen times, and was getting much further in the event than before i changed mods. Then one time things just "clicked", and finished it. It was the same strategy every time, yet got very different results. My mods are what they are, not the best overall, but that was the difference maker to me. And I jokingly commented on discord that I "found" a +17 speed mod on an unused character. Not sure why it was there, but happy to have it in use now. Took me four hours. Just by random chance I beat it. This is by far the hardest thing in the game. I have the same issue, I'm trying my luck with boba lead and despite the fact that I geared boba and dengar with 3 g12 pieces each, I still haven't killed chewie. Most of the time, and I am not joking with this, is when everyone hits dengar and he survives with 10% HP and then R2 stealths everyone. How is this possible, I have no idea? I am now gearing Greedo to g11 and hope I see some difference, but I'm pretty sure it's not gonna stand out. I have 456.25% overall potency and average speed of 172.6 and they die like flies. It is unbelievable. Not to mention the fact that the 6 g12 pieces that I put on boba and dengar are the pieces I acquired over 1 1/2 years since I'm playing. My experience was rather different. I lost three times. Moved my arena mods to my Bounty Hunters. 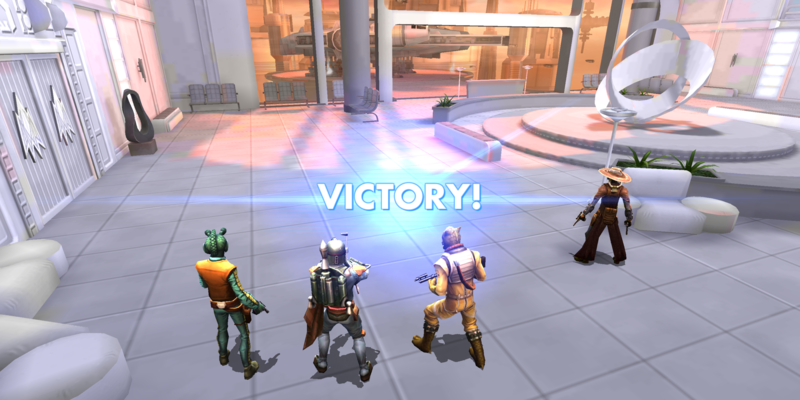 Beat it first try with only losing Cad and Greedo (zBossk (L) g12, Boba g12, Dengar g9, Cad g10, Greedo g10). Was only 6*, not 7* but it still took about 25-30 tries. Speeds aren't that great, but it was quite the challenge and definitely exhilarating to finally clear it. Was really concerned I'd need G9 across the board.